So last time, we looked at a Removable mattress for Barbie’s wooden bed. 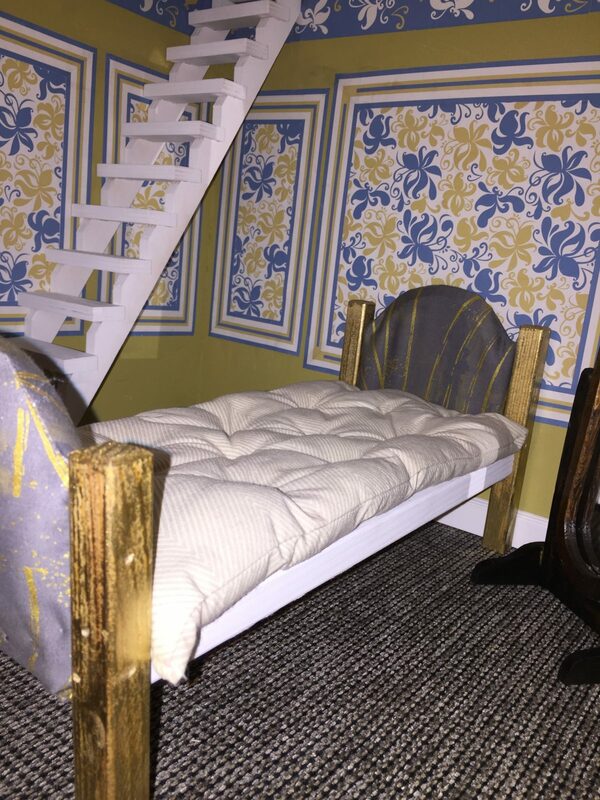 Let’s take a look at my new favorite – a barbie doll bed mattress sewn into the bed’s platform. As a reminder, the wooden bed measures 12-1/2″ x 5-3/8″ wide. 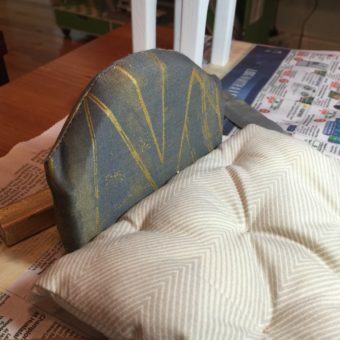 I used the same finished measurements as I did for the Removable Mattress: Cut 2 pieces of fabric – 14″ x 6-7/8″. This allows for 1/2″ seam allowance and some extra for the tucks which will shrink the size just a bit. I didn’t use the side strip; rather I just sewed the top and bottom piece together. 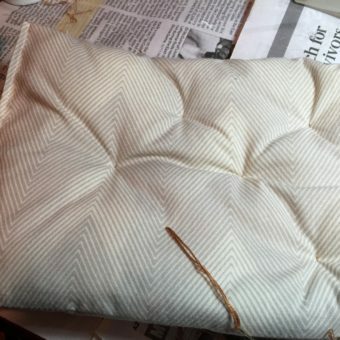 This time, instead of sewing the tucks into the mattress after you stitch the top and bottom together, we do something different. I made a paper template of where I want the tucks in the mattress to go. Here’s the template instructions. 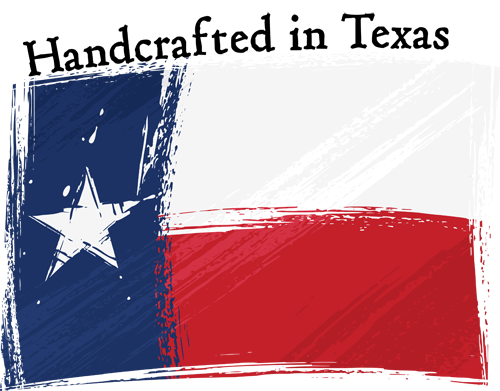 Take an 8-1/2″x11″ piece of paper and cut it to 5-3/8″ wide x 11″ long. Fold it in half the the long way. Fold it again in half. And fold it one more time in half. Unfold the paper and then fold it in half the long way. Fold it in half again. 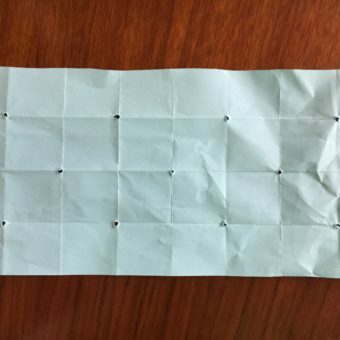 Open up the paper and you should see a grid like in the picture. Mark holes as indicated in the picture. 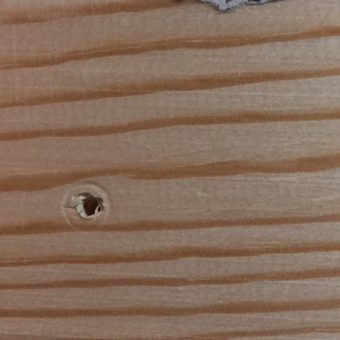 Next, using my template, I marked through the holes in the template with a pencil and then drilled holes in the base of the bed. 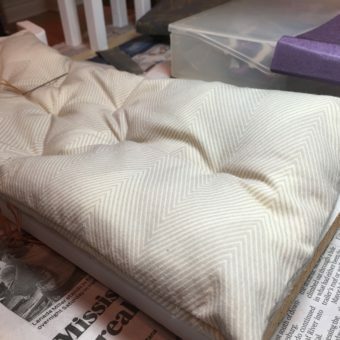 I used about a 1/16″ drill bit but you can use what ever you need to get a needle and some embroidery floss through the hole and into the mattress. I use a big embroidery needle because it’s easier to thread the embroidery floss. BTW – I’m using 3 of the 6 threads in the embroidery floss. Center the mattress on the bed and then while holding it in place, insert your needle and thread through the hold on the bottom side. 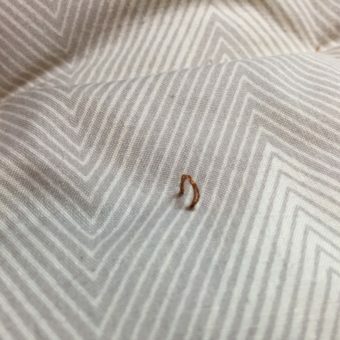 Draw the needle straight through the mattress. Then move about 1/8″ away from where the thread came through and draw the needle back through the same hole. Pull the two threads on the bottom side of the bed tight to form a tuck and tie a knot. 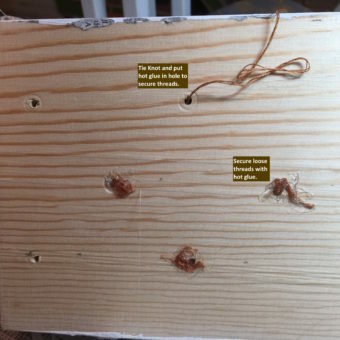 Because the drilled hole is probably bigger than your knot, you’ll need to secure the threads with hot glue. 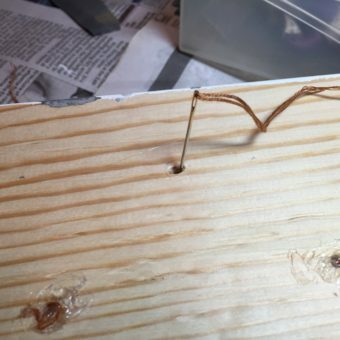 I but some glue in the hole, let it dry (takes about 10 seconds), and then I glue the threads down so there’s little opportunity for the threads to come loose. Here’s some more pictures of the process and finished product. Let me know what you think. 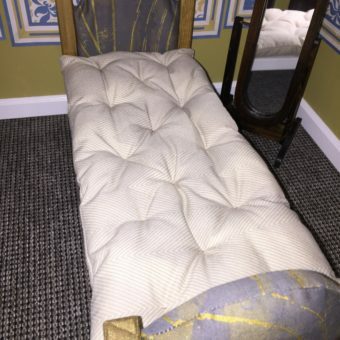 This entry was posted in Decorating, Furniture and tagged Bedding, Decorating, Furniture, Upholstery.